Many have criticized news man Anderson Cooper for what they consider diluting his credibility by doing a daytime talk show. Whatever you think of it though, you have to give him credit for shining a light on topics that are important to him. One such topic is loss and how “closure” is not something that can easily happen, or happen at all, when missing a loved one. All we can hope for is that time and working through it lessens the pain of the loss, and that missing that person becomes less of a burden and more a remembrance. Here’s his latest show, wherein he calls on his mom’s wisdom to help him, and his guests tell the emotional truth about their experiences. 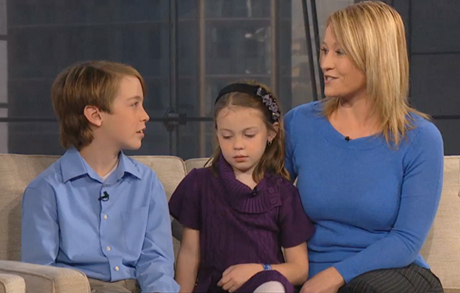 This particular clip is of a boy, Kyle, who lost his dad at 10, two years ago (coincidentally the same age that Anderson Cooper was when his father died). Kyle tells Anderson he allows himself to talk about his dad and cry as much as he feels he has to because it helps him. Kyle says that crying is a sign of strength, not weakness. Wise words for a 12 year old. Kyle also talked about feeling frightened when his father died, and in the aftermath he felt that it was his duty now to step up and look after his mom and baby sister. This is an all too common result of father-loss (whether death or divorce), causing a boy to grow up too fast. I recommend watching the show. It’s not a topic Mr. Cooper is likely to let go of. Sometimes when you ask a man who grew up without a father about his dad, he will immediately talk about his mother. He’ll talk about her strength and her sacrifice in having to play both roles. Sometimes he’ll even say that she was so good at it, that he didn’t know what he was missing. 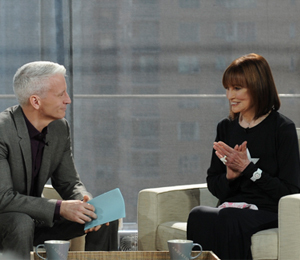 Yesterday, on his new daytime television talk show, he interviewed his 87 year old mother, Gloria Vanderbilt. Now, apart from his infectious giggle, this serious news anchor is usually pretty composed. What brought tears to his eyes on this day were memories of his father, who died when he was 10, and specifically, his mother telling him his dad would have been so proud of the man he became and his accomplishments. The interview also covers the suicide of his brother. Some people like to criticize Mr. Cooper for aspects of his personal life he doesn’t talk about but I think it’s more important that he has never shied away from discussing his father and brother and the impact their loss has had on his life. It takes courage but it helps others in immeasurable ways to use your public platform for the good.